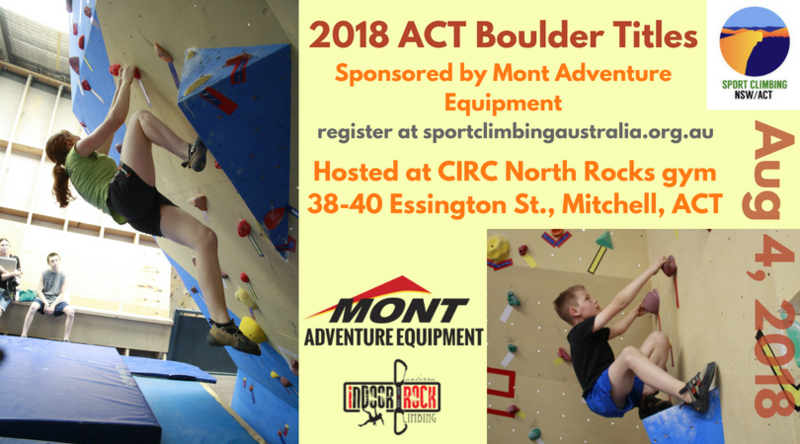 We’re proud to announce that Canberra Indoor Rock Climbing will be hosting the 2018 ACT Boulder Titles sponsored by Mont Adventure Equipment! Hosting the ACT Boulder Titles is something we greatly look forward to each year. This year’s titles will be held on August 4th, 2018 at our North Rocks gym at 38-40 Essington Street in Mitchell. Registration will begin at 8 a.m.
We will be hosting the titles in partnership with Sport Climbing Australia NSW/ACT. Those who wish to participate will need to register at https://sportclimbingaustralia.org.au. All climbers must be 2018 Sport Climbing Australia State or National member. You can view our Facebook event here. To view the complete information packet for the Boulder Titles, click here. We will also be running a fundraiser BBQ throughout the day for Climbers Against Cancer! To ensure the smooth running of the event, Sport Climbing Australia needs the assistance of volunteers on the weekend. We require volunteers for judging, assisting the route-setters, brushing holds, and generally helping out. Please contact canrock@grapevine.com.au if you are able to volunteer. We can’t wait to see you on event day, and we wish all the competitors best of luck!